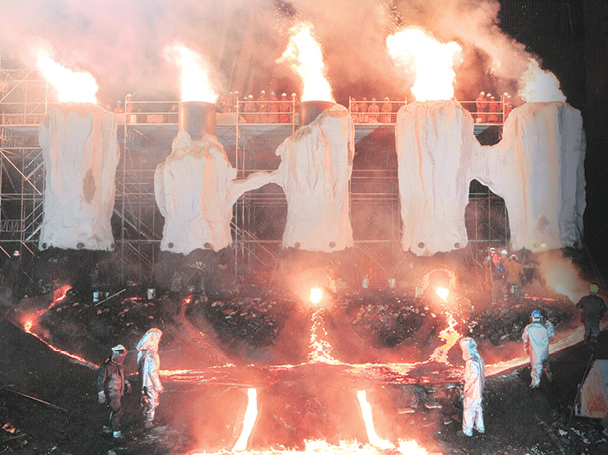 Visionary artist Matthew Barney makes his BAM debut with the world premiere screening ofRiver of Fundament, a radical reinvention of Norman Mailer’s novel Ancient Evenings. In collaboration with composer Jonathan Bepler, Barney combines traditional modes of narrative cinema with filmed elements of performance, sculpture, and opera, reconstructing Mailer’s hypersexual story of Egyptian gods and the seven stages of reincarnation, alongside the rise and fall of the American car industry. The film’s central scene is an abstraction of Mailer’s wake, set in a replica of the late author’s apartment in Brooklyn Heights and featuring Maggie Gyllenhaal, Paul Giamatti, Elaine Stritch, Ellen Burstyn, Joan La Barbara, and jazz percussionist Milford Graves. Alluring and intense, this epic, multidimensional experience is a sprawling allegory of death and rebirth within the contemporary American landscape.